Moderately Difficult, III & IV Class Rapids for Avid Rafters. Costa Rica is well known for its incredible white water rivers that take you through stunning forests and are home to an abundance of wildlife! For all you adrenaline junkies looking for an extreme adventure, then white water rafting the Pacuare River will not disappoint. The river is one of the top five rafting rivers in the world due to both its scenery and intense rapids. After an early morning pick-up from your San José hotel, you will drive to Pacuare, passing the dense primary tropical rainforest of Braulio Carrillo National Park. Once you arrive at the river you will enjoy a traditional Costa Rican breakfast before your local bilingual guides deliver a thorough safety briefing and fit you with your helmet, life jacket, and paddles. 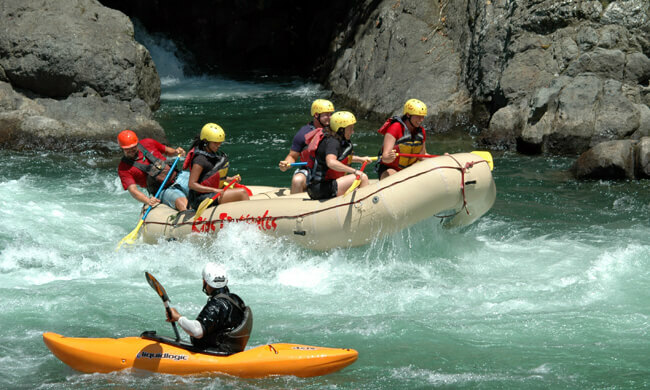 Then start your white water rafting adventure along 18 miles of river, deep into the heart of densely vegetated gorges passing waterfalls and pounding rapids. The Pacuare river is in one of Costa Rica’s most impressive primary rainforests and is home to animal species such as jaguars, monkeys, ocelots, and a large number of birds. After an adrenaline-packed afternoon, you take a short drive back to Ríos Tropicales Operations Center to shower, change, and enjoy a traditional Costa Rican lunch. This is moderately difficult tour that can be done by anyone in normal healthy physical condition. Swimming experience is required. Includes: Transportation, professional bilingual guides, rafting equipment, breakfast, lunch.